In this lesson, we shall learn about the Workbook object. 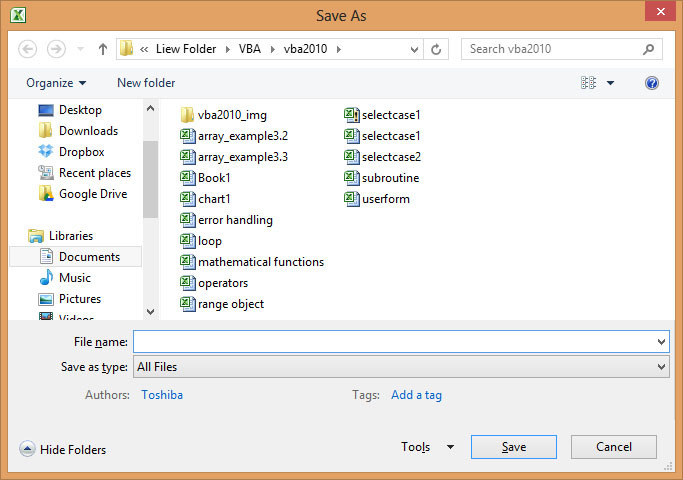 The Workbook object lies at the top of the hierarchy of the Excel 2010 VBA objects. We will deal with properties and methods associated the Workbook object. 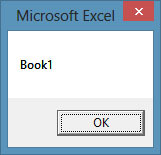 When we write Excel 2010 VBA code involving the Workbook object, we use Workbooks. The reason is that we are dealing with a collection of workbooks most of the time, so using Workbooks enables us to manipulate multiple workbooks at the same time.When will deal with multiple workbooks, we can use indices to denote different workbooks that are open, using the syntax Workbooks (i), where i is an index. For example, Workbooks (1) denotes Workbook1, Workbooks (2) denotes Workbook2 and more. The output is shown in Figure 20.3. In this example, when the user clicks on the command button, it will open up a dialog box and ask the user to specify a path and type in the file name, and then click the save button, not unlike the standard windows SaveAs dialog, as shown in Figure 20.4.